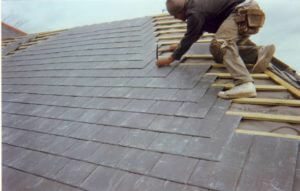 Roofing is a solution for roof installation or roof repairs. Roofing solutions in San Antonio may be obtained at a wide range of prices based on your budget. A roof should not be just designed- but the roofer should understand the physics of your roof and provide you with the best possible roofing solution while ensuring the quality. Many homeowners may not have seen their roof. Hence the roofers need to explain well to the owners about the condition of the roof. A wide variety of roofing is prevalent. The selections include Duration series- Harbor Fog, 3 tab-Desert Tan, Tru Def – Estate Grey, Tru Def – Brownwood, Duration Series – Brownwood, Sierra Gray Duration Series, Amber oak ridge series, Shasta White oak ridge series, Teak Duration Series, Brownwood Tru Def series and Estate Gray Duration series. Roofing may be broadly classified into residential roofing and commercial roofing. Residential roofing makes use of roofing shingles, slate roofing – Tru slate, designer roofing shingles, Timberline architectural roofing shingles, 3-tab shingles, attic vents and roof ventilation, GAF lifetime roofing system etc. Commercial roofing makes use of flat roofing system, asphaltic accessories, built-up roofing, modified bitumen roofing, single-ply roofing, TPO roofing, liquid applied coatings and membranes, specialty roofing products, roof insulation and fastening with adhesives primers and sealants etc. Products include weathered wood HD, Barkwood HD etc. Standing seam metal roofing is different from a metal roofing. In standing seam metal roofing, continuous panels run from the ridge of the roof to the eaves down. Seams are between the panels connected by fasteners which are raised above the level of the metal roofing. Hence the name ‘standing seam’ because the seam is raised or standing. Seam fasteners will be from 0.5” to 1.5” high. The fasteners are concealed and hence, you see only a smooth continuous ridge extending from top to bottom. Roof panels may be either pre-formed or site formed. The width of the panels is 12 to 19 inches and is composed of Galvalume-coated steel or aluminium. Seams may be High seams or Fewer seams. Seams are the weak point in any roof and are a potential entry point for moisture. In High Seam, the seam is raised above the level of the roofing panel. Metal seams run unhindered from the top to bottom of the roof. In Fewer seems, there are no horizontal seams and in total, the roof has a far fewer number of seams. Metal roofing in San Antonio is very tough but not entirely impervious to all hazards. The sheet metal in this type of roofing can be penetrated by heavy falling limbs or dented by a hailstorm. With proper maintenance, a metal roof will last from 30 to 50 years. The metal roof is also called as cool roof because they can be painted in any color, including colors on the lighter end of the spectrum, which will prevent solar heat gain.